Basically this heater is used in corrugated paper making machines of different sizes & capacities to heat up the rollers. 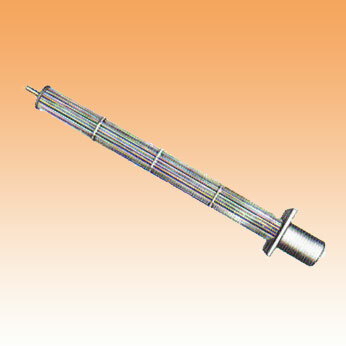 1) Tubular type heaters consist of 9 Nos. tube elements fixed on a terminal box, it has one supported bar in the middle which is longer than rube elements, sheathing of heater is m.s. or s.s. helical coil of resistance wire duly embedded in refractory material inserted into the sheathing. 2) Rod type heater-resistance wire wound coil supported by porcelain blocks is inserted into the perforated tube. Terminals are in the flange at one end of tube, another end is provided with supporting bar. This type of heaters have facility of quick replacement of element thus production does not suffer.